Bath Fusion bathroom sets will instantly refresh tired bathroom decor with vivacious on-trend patterns in rich, saturated colors. Shower curtain: 100% polyester; Bath rugs: 100% olefin. Bath towel:100% polyester.Machine washable. Imported. 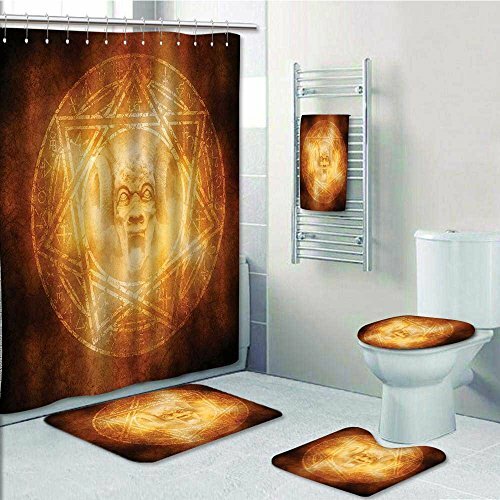 *Adds real value and depth to your bathroom decoration. *High resolution pictures and photographs brings 3D like realistic experience to your life. *No color fading as you use the shower curtain thanks to the new digital printing methods. *There will be no color difference on the surface and the cloth will not be easily damaged as a result of machine washing as it is made of very high quality %100 polyester tight woven fabric. *It is not too thin or too thick. Waterproof and dries fast after you take a shower. Easy to use. Customized, personalized products are very popular. As manufacturers of digital printed home textiles, we follow current trends and bring you the latest home fashion. Either a gift to your family or friend, relative or boyfriend girlfriend, or a gift to yourself, the item should be interesting, authentic. 5 Pieces Bathroom Accessory Set:1Shower Curtain 60"x72"+1Bath Mats 23.6"x15.7"+1 Contour Rug 15.7"x15.7"+1 Lid cove1Bath 15" x 18"+1 Bath towel 55.1"x27.5";(Give 12 shower curtain metal hooks). Material:Shower curtain/100% polyester; Rug/100% microfiber polyester&Rubber Backing;Bath Towel/100% polyester;shower curtain hook/High-grade metal. This 100% Polyester shower curtain can be used with any traditional, freestanding, or claw foot bathtub. Use of a liner is recommended, to keep the shower curtain looking new. If you have any questions about this product by aolankaili, contact us by completing and submitting the form below. If you are looking for a specif part number, please include it with your message.